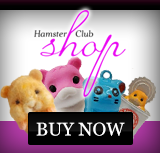 Hamsters make good family pets as they need very little space, and are easy to look after. They are nocturnal and therefore like to hide away during the day, but will come out to play in the evening. Well looked after hamsters are quite happy living on their own, and it actually best to keep Syrian hamsters singularly. Both males and females will fight if kept together, so if you want to keep more than one animal it is probably better to consider dwarf hamsters or gerbils. The Syrian or Golden Hamsters come from the deserts of North Africa. They were first bred in captivity in Israel, from where they were introduced as pets to Britain. More recently other breeds have appeared from different parts of the world, such as the Russian or Chinese Hamsters. Hamsters need a lot of exercise, so buy the biggest cage that you can afford, preferably at least 60 x 30 x 45 cm. Plastic or metal cages are best, since wooden ones will be gnawed and splinters can damage the hamsters pouch. Wooden cages are also much more difficult to clean and soon start to smell. Modular stacking systems such as Rotastak provide lots of interest and fun for pet and owner alike, and have the advantage that extra rooms can be added to make them larger. The floor of the cage should be covered in woodchip or shredded paper, but hay and shredded dishcloth products should be avoided as we have seen several cases where they have become tangled around hamster�s legs cutting off the blood flow and necessitating limb amputation. Hamster cages should be cleaned once a week with hot water and a pet safe disinfectant. As hamsters naturally divide their accommodation into eating, sleeping, bathroom and play areas, providing a gnaw-proof bedding area will help your hamster keep his bedding in one area only. This also makes it easier to remove soiled litter from the toilet area daily. Hamsters in the wild are omnivores and will eat a wide variety of food. However, a dry hamster mix or pellets will provide all the minerals, vitamins and nutrients required and are clean and hygienic. Hamsters will hoard their food and therefore fresh fruit, carrot, lettuce or cabbage should be fed by hand so that you know it has been eaten and not hoarded away where it can rot. Mineral blocks and the occasional chew treat are usually popular, and the latter can be used to help tame your hamster. Food bowls should be sturdy and hard to tip over as the hamster will climb into them. They should be gnaw-proof and easy to clean. Remove uneaten food and wash the bowl daily. Similarly, a water bottle and drinking tube should be provided and cleaned and refreshed daily. When you get a new hamster, leave him alone for the first couple of days, to allow him to adjust to his new surroundings. After that it is important to handle him regularly to build up a relationship. Hamsters are renowned for having very poor vision, so before picking him up, talk to him first and let him get used to your voice. Then introduce your hand so that he can become used to your smell. Finally pick him up very gently by cupping one hand under him and one over him. Young children should be supervised when handling hamsters and must take great care not to drop them. Eventually he should come to you and eat out of your hand. Hamsters like to exercise daily and if provided with a wheel, or a ball, can run the equivalent of 4 to 8 miles in an evening! This should be borne in mind when choosing where to locate their cage, as this level of activity can easily disturb human sleep, especially that of a child. Hamsters normally stay healthy throughout their short lives. However, there are a number of common complaints, most of which can be avoided by looking after them correctly. If your hamster�s coat appears ruffled, he loses his appetite, coughs and sneezes and has a nasal discharge, the hamster probably has a cold. Keep him warm, and if signs persist contact the practice, as he may require antibiotics. Hamsters can catch colds from humans, so avoid handling if you have one. Colds can be avoided by keeping the cage away from draughts, and at a temperature of 18-22 degrees centigrade, and providing plenty of bedding. Hamsters are susceptible to severe diarrhoea known as Wet Tail, which always requires immediate veterinary treatment. It can be caused by rotten or mouldy food or bedding, or brought on by stress, such as over handling a new hamster. In mild cases of diarrhoea, fruit and vegetables should be withheld for a few days. Hamster�s teeth grow constantly throughout life, and if they get too long, can prevent the hamster from chewing properly. Hamster treats, apple tree wood and mineral stones all help him wear his teeth down. Never let a hamster out of its cage unsupervised, as they like to chew things, especially electric cables! The right pet for you? Hamsters are lively and clean and most are happy to live alone, although some species will live as pairs. They can take time to become tame and need to have peace and quiet during the day because they are nocturnal. To live alone (some dwarf species will live as pairs). Daily feeding on a mixed diet of seeds, grains, nuts and washed fruit and vegetables. A constant supply of fresh, clean drinking water in a drip-feed bottle with a metal spout. A large home that is kept in a warm place indoors, out of direct sunlight. A nest box inside their home. The hamster needs somewhere it can burrow out of sight to sleep and hoard food. Clean white kitchen paper for bedding. Do not use newspaper or cotton wool. A solid exercise wheel (no open rungs) should be fixed to the wall of the hamster's home. Toys, like cardboard tubes and wooden cotton reels. Their home to be tidied every day and thoroughly cleaned every week. A hardwood gnawing block to wear down long teeth. Hamsters live for up to two years. In the wild, hamsters make underground homes and have strong nest building instincts. They are nocturnal and should be left alone and quiet during the day. If the temperature becomes too cold, they may go into a deep sleep called hibernation. When two or more hamsters are put together they usually fight, so it is best to keep just one hamster. However, some dwarf species will live happily as a pair - so ask about the particular hamster you are buying. Pick up a hamster very gently using both hands as a scoop and stay close over a flat surface. Hamsters move very quickly and are likely to jump if they are frightened. The RSPCA strongly advises that you do not breed from your hamster as it is very difficult to find good homes for the young. 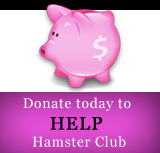 The best way to ensure that hamsters do not breed is simply to keep the sexes apart. If your hamster develops skin sores, bathe them with warm water containing a mild antiseptic. If they persist, seek veterinary advice. Loss of fur and sore skin could also indicate parasites or the fungal disease ringworm. Sore eyes can be caused by dusty bedding, old age or breathing problems. Ask your vet for advice. Hamsters may suffer from overgrown teeth and claws. Both can be trimmed by a vet. The lining of a hamster's cheek pouches is very delicate and can be damaged by wood splinters or sharp food. If any material becomes lodged in the pouches, seek veterinary advice straight away. If a hamster is sneezing, breathing slowly and has a sore nose, it may have an infection that could develop into pneumonia. Keep the hamster warm and improve its diet, but seek veterinary advice if symptoms continue. Wet tail is a potentially fatal disease that is highly infectious. If a hamster is tired, loses its appetite and has watery diarrhoea, seek veterinary advice straight away.